At least two features about this work may excite attention before one even considers the music itself: Marin Marais is probably better known for his viol music than for his operas, and this example treats the same subject as the far more famous English music drama by Handel. Marais actually played a prominent part in the Académie Royale de Musique (or Paris Opera) under Lully, and so it is unsurprising that he took that composer’s operatic models as his starting point, though Marais’s greater melodic and emotional depth pave the way for Rameau’s later masterpieces in the French tradition. With a sizeable orchestra and chorus this re-issued recording is opulent. 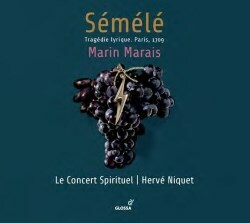 Hervé Nicquet establishes solemnity and grandeur from the outset with the gravitas of the Overture, but there is also a real sense of lithe movement in the music as Le Concert Spirituel bring a light, airy touch to it. Nicquet might, perhaps, have experimented with using different numbers of singers among the choral numbers of the opera for the sake of variety, but that is certainly not a major flaw, as the chorus often sound immediate and vivid, and very much a part of the drama. Furthermore, much of this performance is instilled with the requisite gracefulness and a lively pace as the score proceeds, bearing the evidence of the experience gained in the live performances that were given prior to this recording. In particular the alert pulse of Act Two’s remarkable chaconne impels that movement forwards with impressive momentum over nearly seven minutes, through its changes of meter and timbre. A similar accumulation of tension and drama serves the narrative thrust of the work effectively as the Thebans await the appearance of Jupiter in the repetition of their chorus in Act Five [CD 2, tracks 27 and 28] before the tragic denouement and earthquake, accompanied by some vibrant effects [track 31]. This version of the myth reveals a more temperate Sémélé than her pleasure-seeking, narcissistic equivalent in Handel’s music drama. Shannon Mercer certainly sings with flair and determination – notably in the episode in Act Four where she insists on seeing Jupiter in his real, divine state, his having appeared to her only in the human form of Idas up to this point. But her interpretation encompasses charm and dignity as well, for example in her more lyrical Airs in Act Three as she contemplates her infatuation with Jupiter, the closest she gets to Handel’s ‘Myself I shall adore’. Even so, she is distinguished by greater forcefulness from her maid and confidante Dorine who, in Bénédicte Tauran’s performance, projects the music with radiant modesty by way of contrast. Tauran has some delectable exchanges with Arbas – the god Mercury in disguise – where Lisandro Abadie’s singing is gentle in volume, though deep and almost rough in timbre. In the guise of Mercury, properly, Abadie is rigorous and assured. Thomas Dolié is the amorous chief god, Jupiter, who sings with more alacrity and effusive charm than Mercury. Marc Labonnette as Sémélé’s father, Cadmus, sounds urgent and hard-edged as he recommends Prince Adraste to her in marriage. Anders J. Dahlin distinguishes that role, musically, from the real object of Sémélé’s love, Idas, through his ringing haute-contre voice, which is a touch shrill initially; but he is more eloquent as he enlists the help of Hjördis Thébault’s haughty, blustery Junon in exacting jealous revenge upon Sémélé. In the allegorical Prologue, justifying the enactment of the drama that follows, the uncredited haute-contre singer of Apollon (presumably Dahlin) sounds oddly weak in tone for this appearance of the god who leads the Bacchanalian revelry, and commands the re-telling of how Bacchus, the son of Jupiter and Sémélé came to be brought into the world. The sweet-voiced Grande Prêtresse of Jaël Azzaretti also serves as a ravishing call for the rehearsal of those events. The engaging interpretation by the cast and orchestra makes this a highly commendable recording which is self-recommending to fans of Baroque opera. But it is also worth investigating by those put off by the histrionics and artificiality of the more prevalent Italian forms of that genre and who look for more subtle, structurally fluid drama instead, in which the music serves clarity of expression of the words. In that respect, Marais’s work is persuasively realised here.